Messages appear as a pop-up window on your employees’ desktop monitors. The notifications show up in a way that can’t be missed or ignored. When a crisis takes place you can let employees know, at the click of a button, what is happening and what steps they need to take to be safe. A scrolling news feed that appears on employee screens keeping them up-to-date with important information, announcements and events relevant to your company. No matter where your employees are – if they work in the field or are travelling – they can receive DeskAlerts notifications straight to their Android or iOS devices. Make the most of the valuable real estate provided by blank screens by displaying screensavers with targeted messaging and content. Engage your employees by sending surveys, polls and quizzes straight to their screens and get results in real time. Integrate with your company’s Active Directory to create custom audiences. By using DeskAlerts’ third party integration API, you can trigger DeskAlerts to be sent from inside other software applications. Determine the success of your campaigns by analyzing data about user responsiveness to your messages. 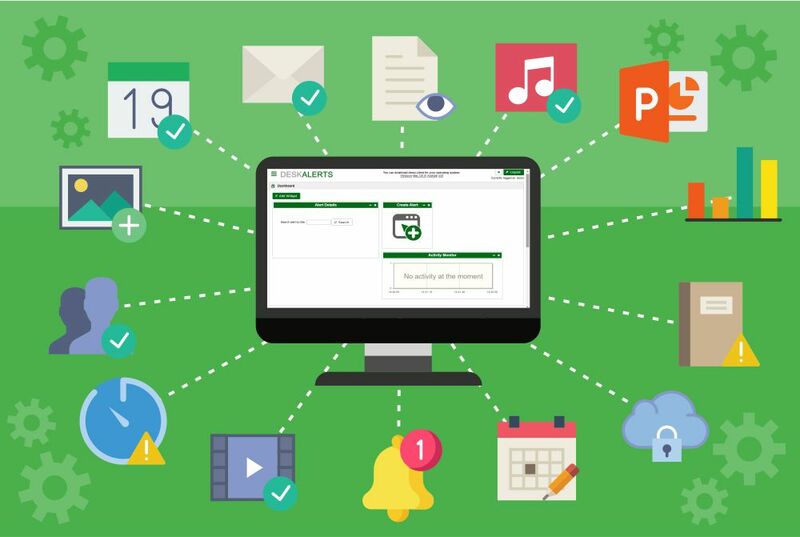 With DeskAlerts you can quickly and easily send desktop notifications straight to your employees’ computer screens that appear in a pop-up box. This is a deliberately disruptive internal communications channel that cuts through the digital clutter and noise – appearing in a way that can’t be skipped, ignored or minimized, giving your peace of mind your corporate communications are being delivered. 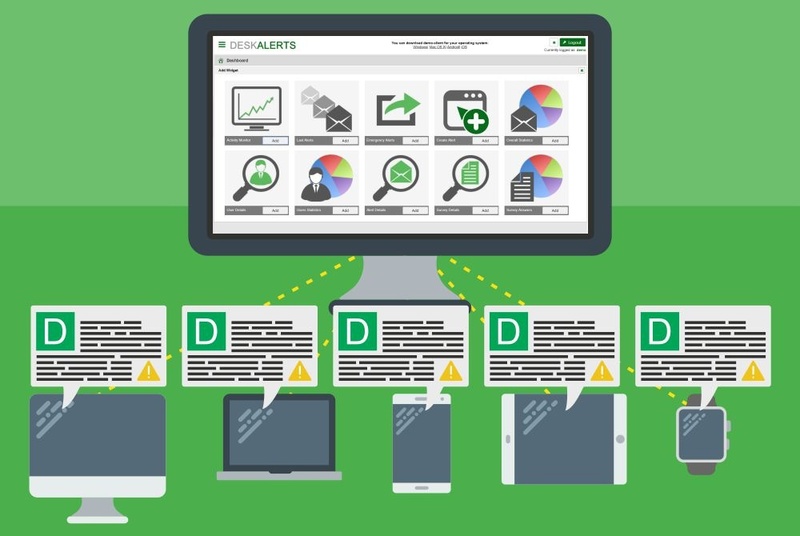 As well as computers, DeskAlerts notifications can be sent to smartphone and tablets, and are compatible with both Android and iOS operating systems. The notifications can also be sent from a mobile phone application meaning you don’t have to be sitting at your desk in an office in order to communicate quickly with your employees. Other features of DeskAlerts include integration with your Active Directory, centralized data storage, multi-domain support – and more! All of this is via one easy to use interface. Utilize LCD, LED and projection displays within your organization to show video content that promotes your company and campaigns. Even if an employee’s screen is locked because they have stepped away from their computer, messages can be pushed to display on these screens. Send your notifications through the traditional channel of email. Utilize the space on your employees’ desktop background to display important corporate information and messages in a more passive way. Video content is eye-catching and engaging. DeskAlerts enables you to send video messages in a variety of formats. Wherever your employees are, you can send them an SMS alert with news from your company. Coordinate attendance at corporate events by bypassing the email system to send and manage invites. Create a custom news feed from a variety of sources such as blogs, SharePoint, Exchange and websites. Use the DeskAlerts interface to create engaging newsletters your employees will want to read. Save Your Time By Sending A Pre-Defined Messages To A Pre-Defined Audience. Deliver Urgent Alerts In One Click. Reach employees in real-time. Use a dedicated client app, so that your message is not just “another email”. Schedule alerts and have them automatically close, keeping the content fresh. You can send content in a range of formats including text, video, graphics or send hyperlinks. You can also send quizzes, polls, and surveys or use it to get employees to RSVP to important events. Our messages can be also sent to custom audiences. You can easily control which users receive DeskAlerts notifications and remove and add new users. And you can also limit users receiving rights, for example, you may want to stop someone from receiving who hasn’t paid subscription fees. No matter what urgent communication you want to deliver to your employees, you can do it with DeskAlerts. Send trading information, online learning modules, training videos, research and case studies, corporate news, conference and seminar opportunities and much more!